Ghanaian-British architect Sir David Adjaye was on Kim Hill’s show recently, talking about his work. He provided an interesting description of what he thinks a modern library is like. 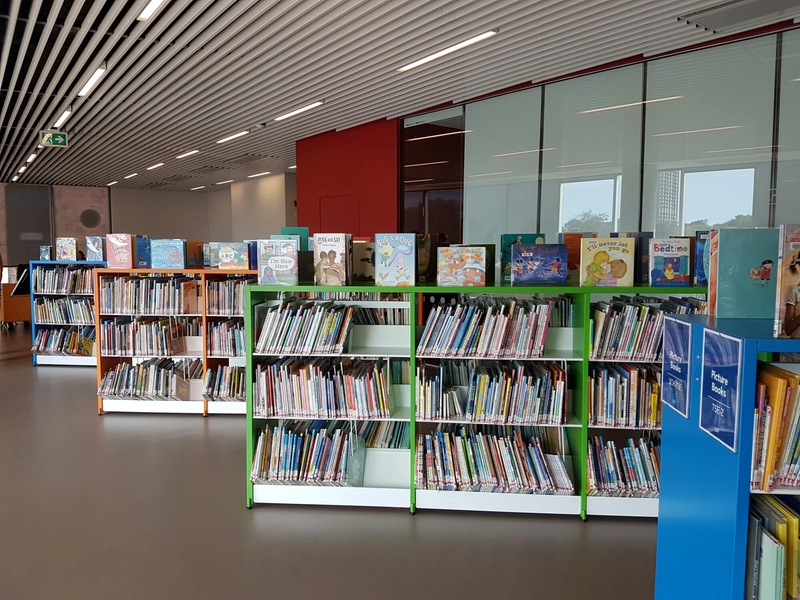 Think about the library as a network hub, a place where the community hall is merged with the library, and social services are also activated there. So you have life-long learning, you can learn motor mechanics, flower arranging, yoga, you can get a book, you can get a class on languages, you can get government services. 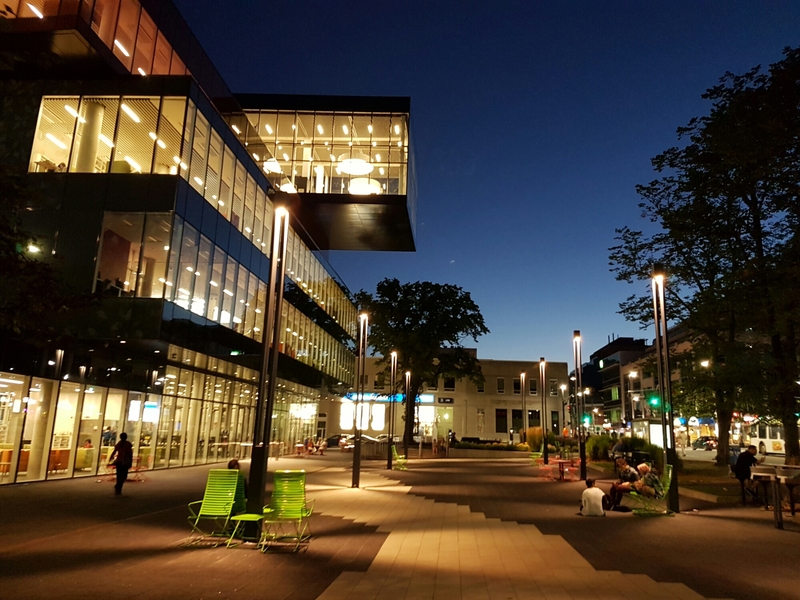 So it really becomes a hub, and it becomes one of the few places where you see multi generations of people, people of different languages and backgrounds, all coming under a service that is supplied in their community and neighbourhood. And it helps with this idea that the library is more than just a container for books, which is really a post-war idea to do with educating and edifying communities, but the library has become in our communities a place where communities overlap and children and adults overlap, a place which can edify and continue life-long learning, which we know is now incredibly important. It’s no longer just getting your education till your eighteen or twenty and then that’s it. There’s so many technological changes, information is changing so much, that life-long learning is part of our way of life in big cities. Aspects of this seem to fit nicely with the vision for our new Central Library. Listen to the full Radio NZ interview with Sir David Adjaye. debate about the Idea Store concept (which Sir David was involved in designing). Check out Author talks on a subdivided city in an age of hyper-diversity. Visited four amazing libraries yesterday -full on day, see second post for branch libraries. 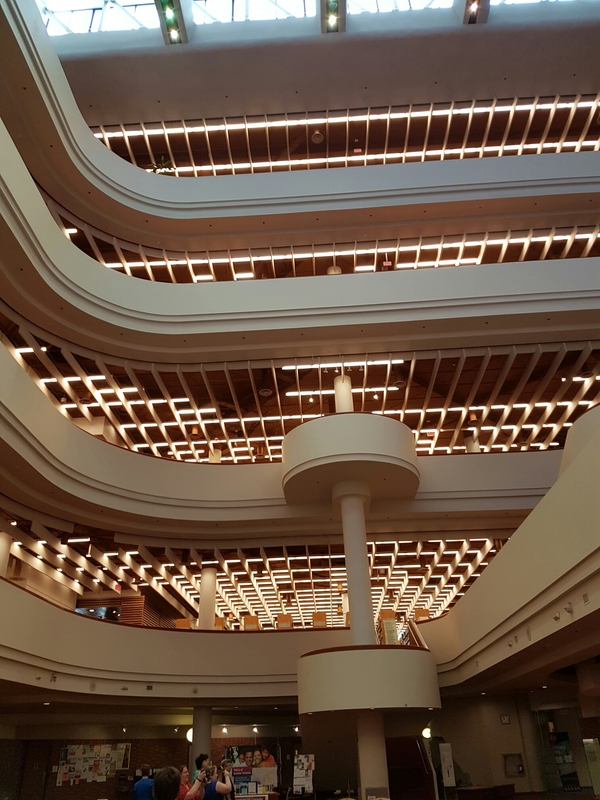 The Toronto Reference Library was reminiscent of our old Central Library with a 70s look but refreshed and inspiring. Lovely atrium creating the sense of where to next! Also glass lifts if you don’t wish to use the stairs. No escalator and while at the time this was seen as short sighted now it’s viewed as progressive. Light, airy, and a wide variety of happenings for the customer in terms of specialist collections, programmimg and reference support. 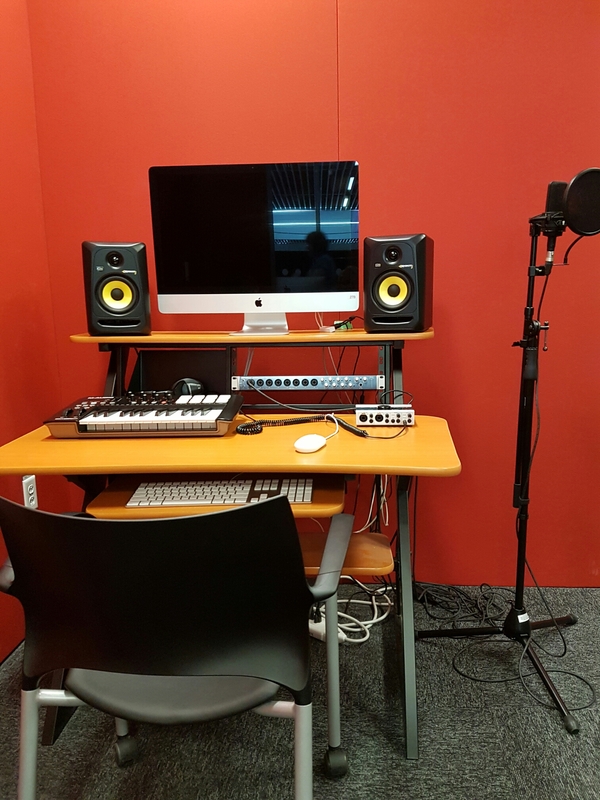 The learning centres are varied in purpose from computers in dedicated spaces, dedicated rooms for learning and a maker space staffed by Digital Design Technicians who deliver programmes, assist customers with 3D printer and design help, customers printing their own books – real cool along with audio and video production. These DDT staff also support the branches with pop up mobile labs that are out on rotation with the DDT to facilitate drop ins, books ins, programmes and staff learning. 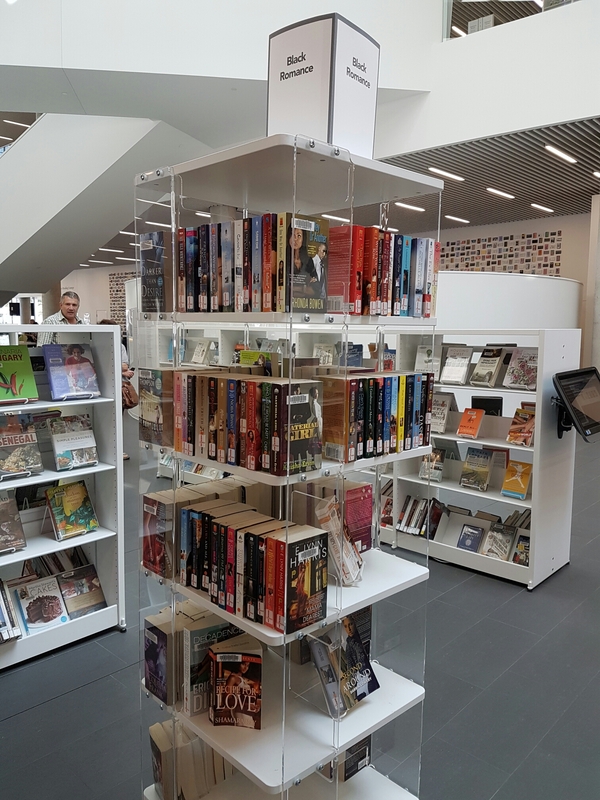 Collections – approximately a third on display, the rest elsewhere but can be accessed on request. Lots of compactums. 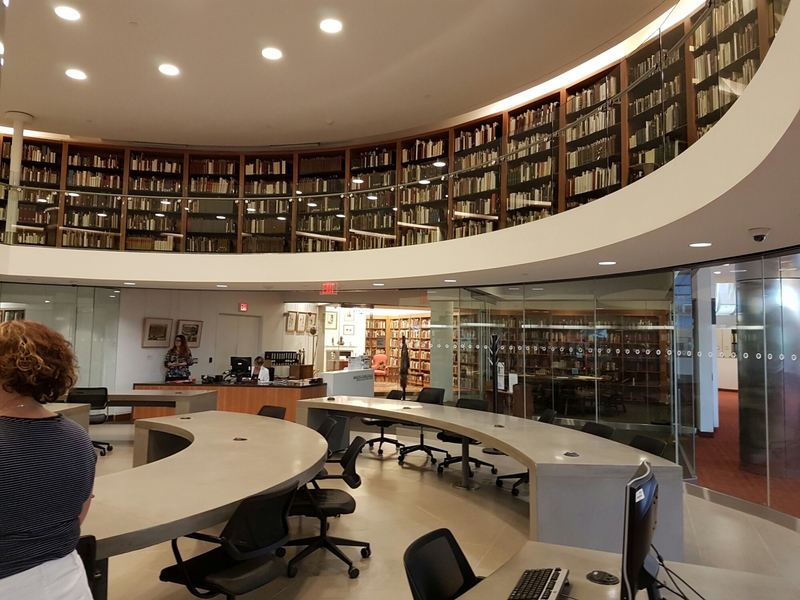 Arthur Conan Doyle collection a highlight – dedicated themed space and a librarian with the true gift of storytelling. Anyone can pop in, relax and select from this wonderful collection. 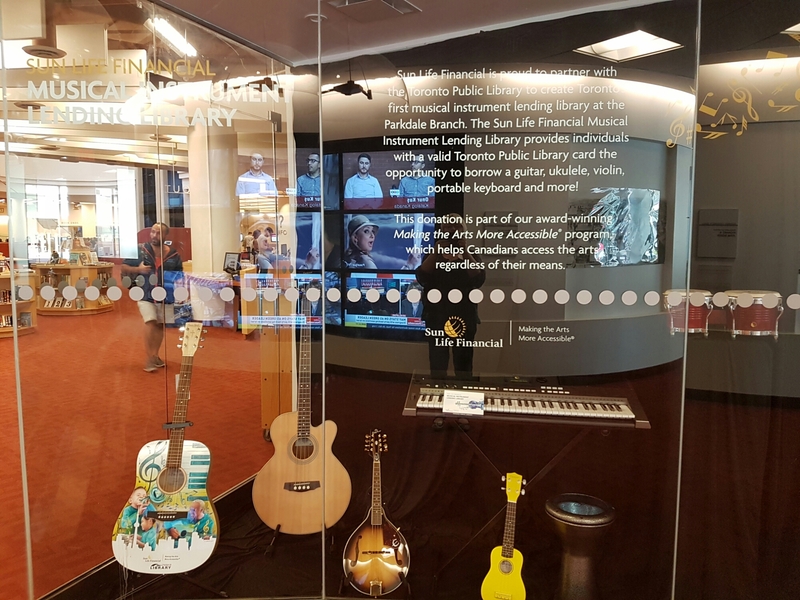 You can also loan musical instruments – well used and valued resource. The Reference area is also a seller for weddings with the couple married at the top with guests seated below – nice little revenue earner. Technology pervasive. Lost count of the screens and number of computers. Cool lighting as well. Wow I am at a loss for words! 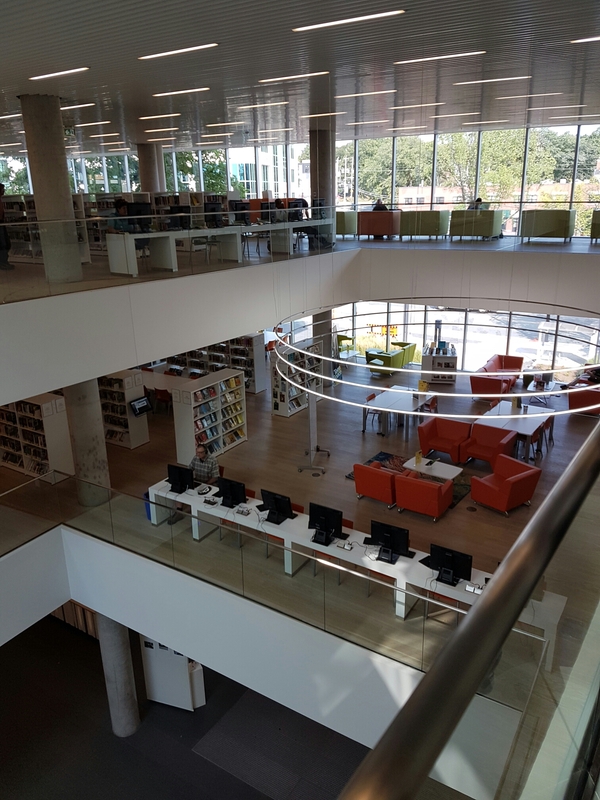 Halifax Central Library is impressive on all fronts – design, flow, colour, warmth, vibrant spaces, diverse services and more – it delivers all with wow! It’s best described like your favourite box of chocolates, customer needs and preferences have all been sought, considered and incorporated into the design and delivery. There is a balance of consistency, variety and uniqueness across the floors so everyone can discover whats on offer culminating in a favourite experience amd/or space. 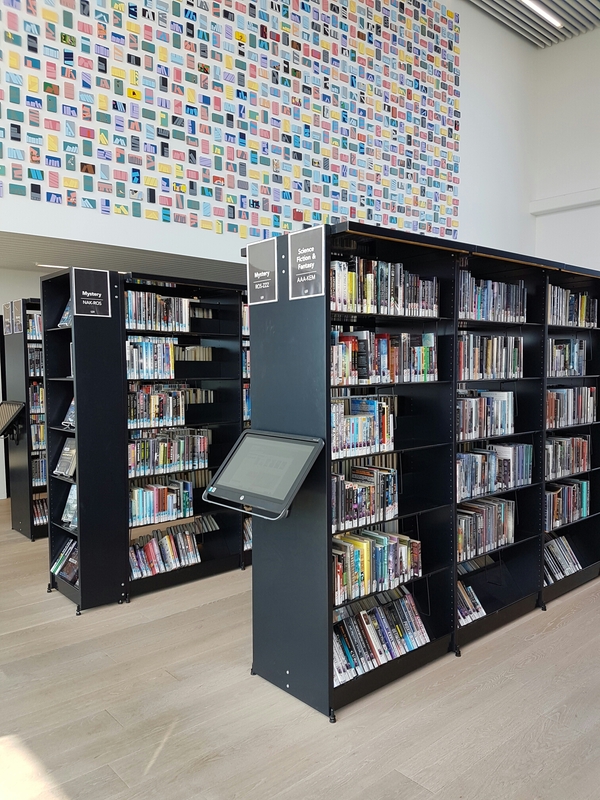 The library as a ‘home away from home’ is fully embraced and repeat visits are clearly the norm with over 2 million visits in the first year. The most common complaint in weekends is “there is nowhere to sit” and people queue outside rushing in to grab these coveted study cells -“they’re the best”. Two lovely customers just arrived and we’re thrilled to get the booth and be photographed. 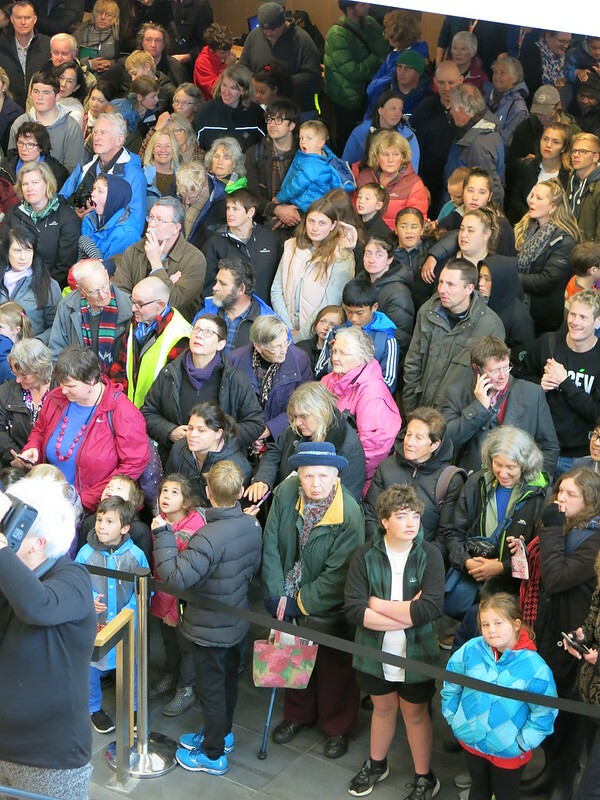 On opening day 400 pairs of safety scissors were given to customers to share in the cutting of the ribbon. Site lines are brilliant and strong use of colour for differentiation a real success. 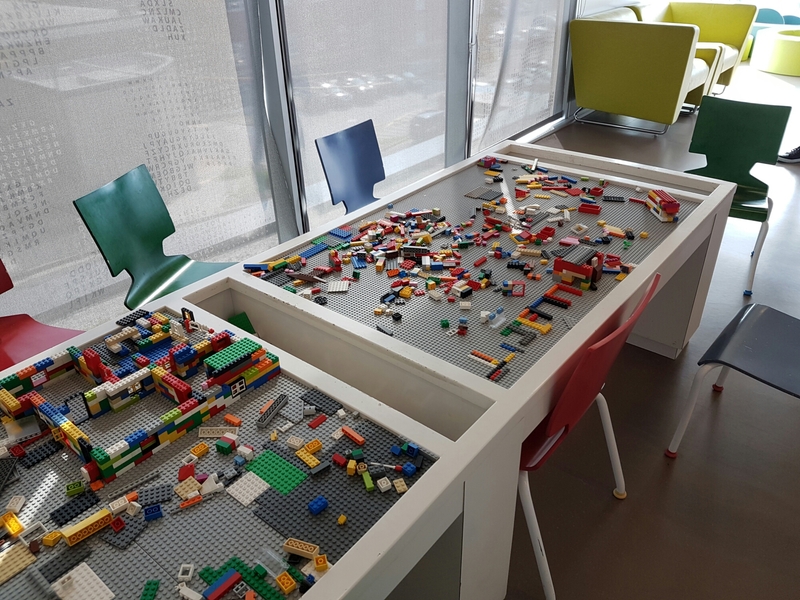 Cool Lego tables ensuring those elusive little bits are stored in the table itself – no storage to worry about. Customers are “living the library life style. Patterns of usage are changing with customers staying longer with an intensity of space use. People have a personal relationship with the library, it is truly the heart of the community and a place of dignity”. Every space is pure delight and despite a repeat visit I could have stayed longer. 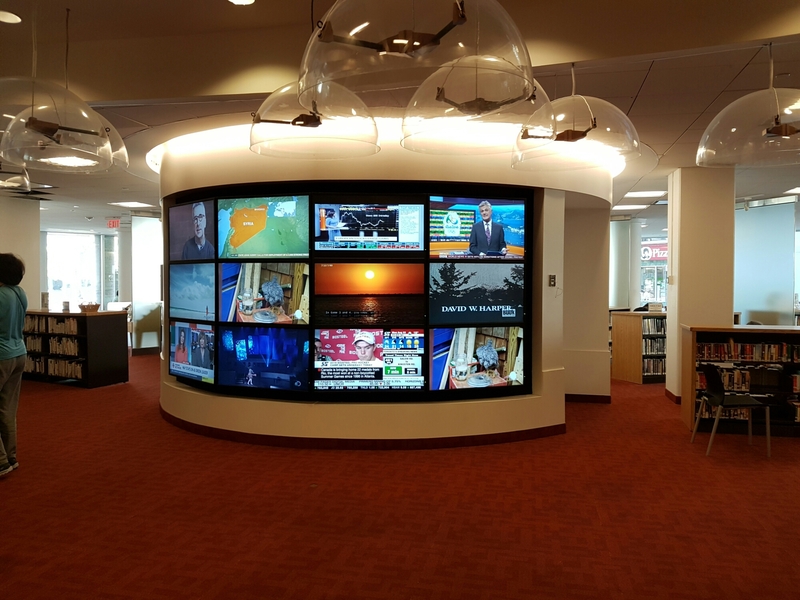 This library epitomizes “for the people by the people” – it is at the heart of the community. Well done everyone 10 out of 10 for an award winning place, space and service. Thanks for hosting us! Multi-award renovation. $1.9 million. 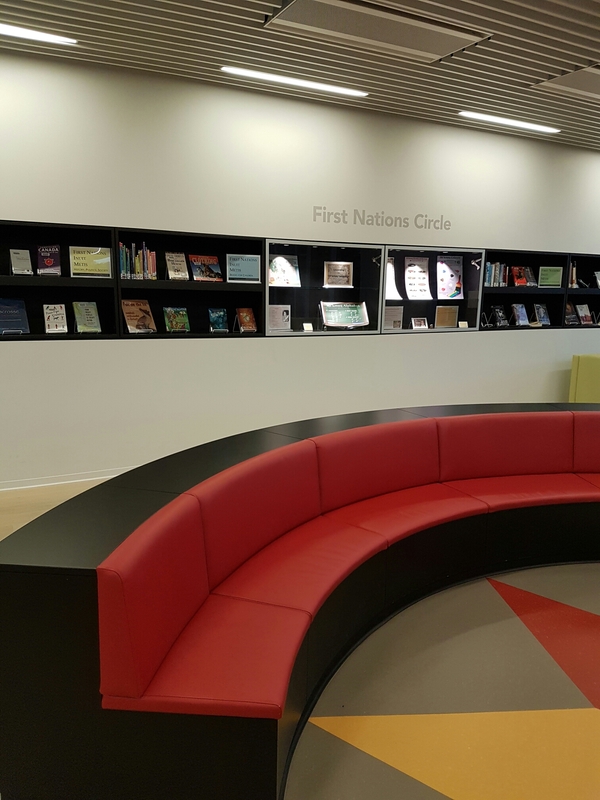 A lovely extensively renovated Community Library blending heritage features with modern building materials to provide flexible community spaces. 1911 – closed in 2006 reopened 2009. Clearly well used and a delightful children’s area with marketing promo ” Kidsstop making waves”. Water is the theme with plenty of interactive activities including puppet hole and assorted lenses creating different views. Kids tops are Literacy based play from birth to 6 years. An example of “daylight harvesting” – letting the light in. Collection size 35k. Population served 26,514. Huge growth in condominiums which housed young professionals in 3’s but by time the library was built they were having babies! Purpose built with designated innovation hubs and spaces for people to “create learn and innovate”. It’s an extension to the communities living, working and social space. Located near to the national historic site of Fort York. Popular programming – need to register for baby times. 6 week programme. Movie day once a month. Digital hub staffed by DDT’S- Art, design and beyond programmes. STEM Storytime also links to their Maker Series of programmes eg Make it and take it! After school clubs , Lego Club, Intro to Arduino, check it out! Collection 42000 items, 14500sq foot branch. 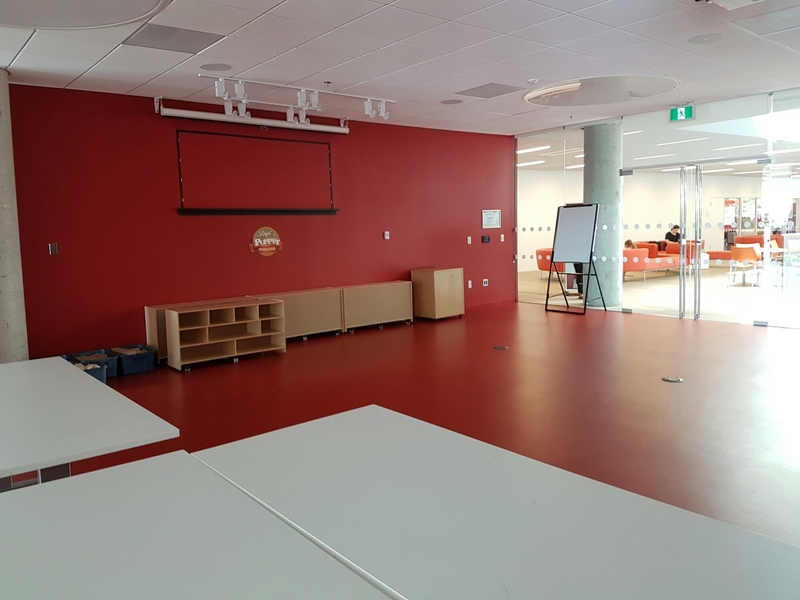 Features KidsStop early Literacy centre, digital innovation hubs, meeting room, study spaces, green roof and more. Great separate programming room and all mobile furniture. 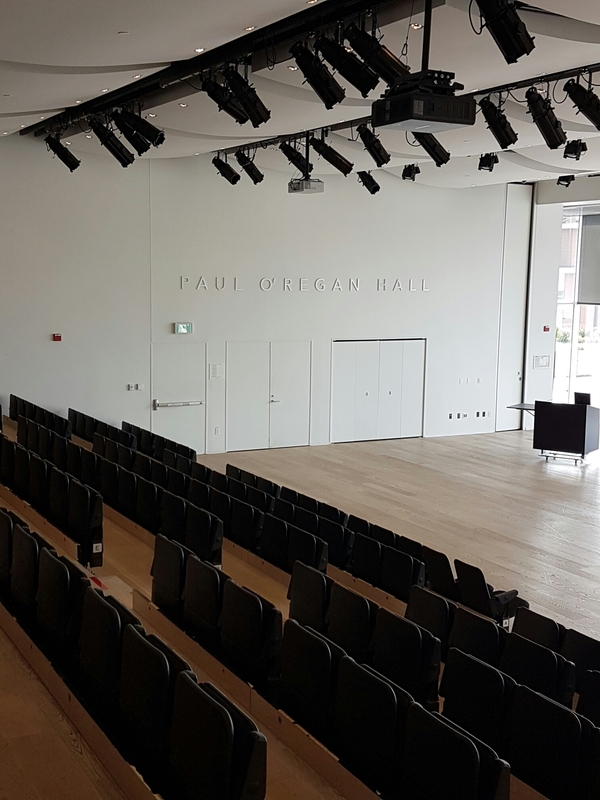 The use of black spruce beams, renewable resource, has to be seen to believed. This unique features adds to the ambience, creates warmth and is pure magic giving the building a special quality and feel. Focus on “middle childhood matters” campaign 6 to 12 year-olds and Library developed its own framework. Programming a strong focus across all ages and stages. The KidsStop early Literacy is pure delight with imposing and fun spaces. 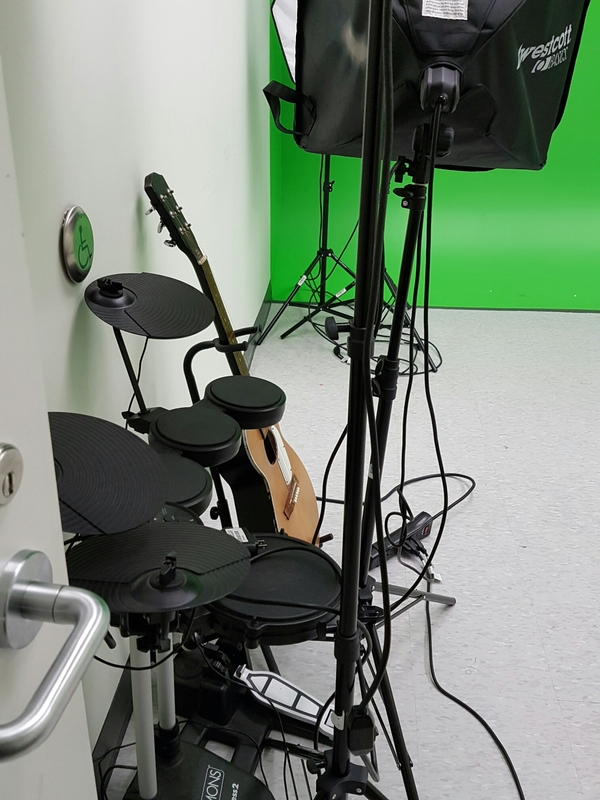 The teens regularly access the innovation hub. Retail principles of book display strongly evident with bold use of colour in furnishings. A delight and as our presenter said you love all your children (libraries) equally but this holds a special place.